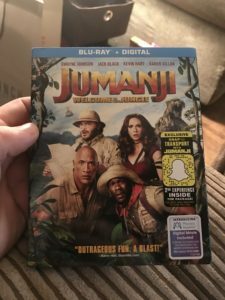 Jumanji: Welcome To The Jungle - Blu-ray Review - ReDVDit! 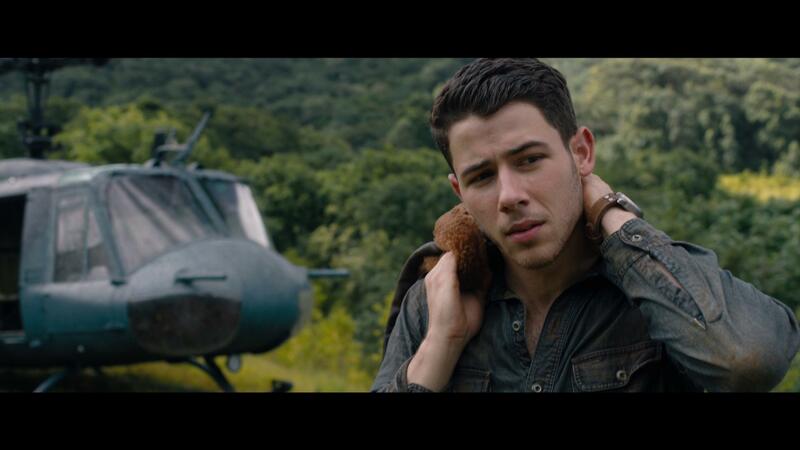 Jumanji: Welcome To The Jungle is a 2017 American adventure comedy film that was directed by Jake Kasdan and written by Chris McKenna, Erik Sommers, Scott Rosenberg, and Jeff Pinkner, from a story written by McKenna. It is a part of the Jumanji film franchise, serving as a direct sequel to the 1995 film, which is based on the 1981 children’s book of the same name by Chris Van Allsburg. The film also pays tribute to Robin Williams, star of the first film, through a mention of his character’s name. The film stars Dwayne Johnson, Jack Black, Kevin Hart, Karen Gillian, Nick Jonas, and Bobby Cannavale. The film was released in RealD 3D and IMAX. 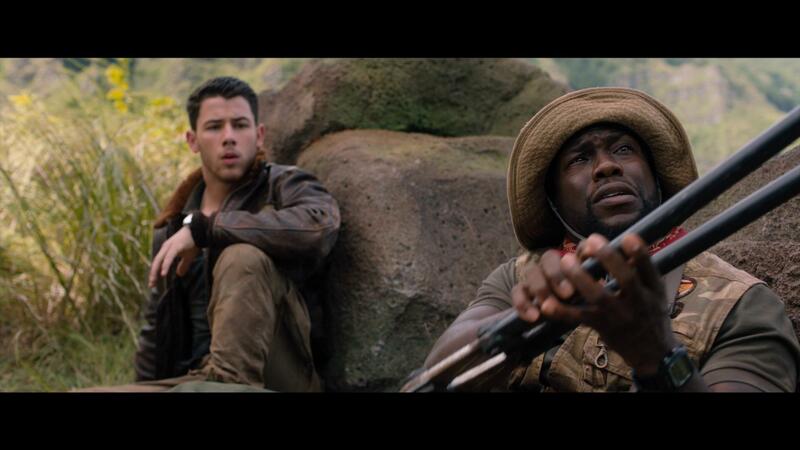 Set twenty-one years after the first film, the plot follows four teenagers who are transported into the video game world of Jumanji, playing as the characters that they chose. Uniting with another player, they must overcome the game’s magical power in order to win and ultimately return home. Principal photography for the film began in Hawaii in September 2016 and ended in Atlanta, Georgia in December 2016. Jumanji: Welcome to the Jungle premiered at the Grand Rex in Paris, France on December 5, 2017, and was theatrically released in the United States on December 20, 2017. Overall, the film received generally positive reviews from critics, who called it a “pleasant surprise” and praised the cast. The film ended up grossing just over $941.5 million worldwide making it the fifth-highest-grossing film of 2017 and the 44th-highest-grossing film of all time. 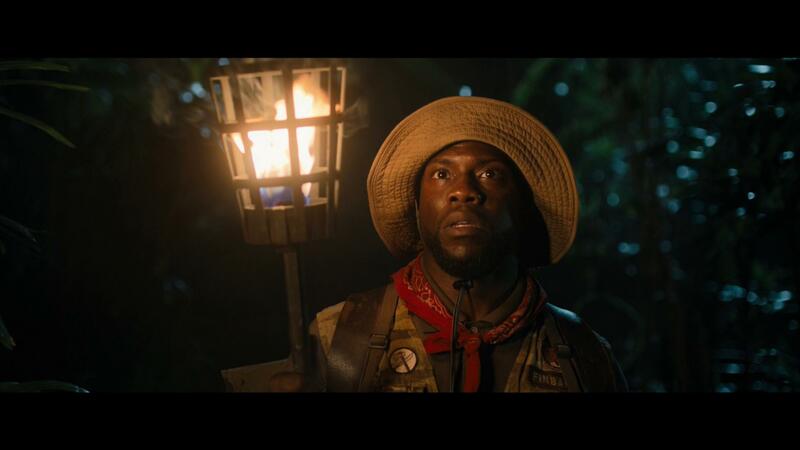 I’m not going to lie, I feared the absolute worst as I went into Jumanji: Welcome To The Jungle. Considering how much importance the first film had on me throughout my childhood; I had no hope for this actually being a decent film; and I was really taken by surprise. Not only does this film offer a new spin on the once told classic of the ’90s, but it offers an inside look into the world that Robin Williams’ character had gotten stuck in. As these new kids are playing an evolved version of the disastrous board game, they are being represented by a group of characters/cast members who seemingly worked really well together to offer a nice, clean and fun wholesome family experience. Paying homage to the time that Alan Parrish spent living in the jungle, we are given a wold of new dangers that weren’t previously made available in the earlier film. The story worked, the performances were great and my wife and I laughed a lot as this movie played onward on our living room television. The Blu-ray release of Jumanji: Welcome To The Jungle offers a really nice, clean look into the jungle as the characters make their way through the game. Offering some really beautiful and vibrant scenery that featured a lot of bright colors. The CGI that was used for the various animals within this universe was nicely done and really did a great job at making them feel as if they were really there, adding to the overall experience. 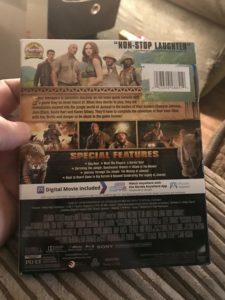 Unfortunately, the Blu-ray release of Jumanji: Welcome To The Jungle comes packaged with a DTS-HD Master Audio 5.1 track. While it does a great job with the channels that it uses, they should have, at an absolute minimum, gone with a 7.1 audio track for this film because the inclusion of the surround channels would have really done a better job at placing the audience in the middle of the action. The channels that are utilized are done very cleanly, dialogue is presented in a clean fashion that allows everyone to be heard and understood without having to manually adjust the volume levels as the movie plays onward. The musical accompaniment for the film was a nice touch and fit perfectly with the overall amount of fun that you can tell that the production crew had set out to offer to audiences. The Blu-ray release of Jumanji: Welcome To The Jungle comes packaged in your standard two-disc Blu-ray amaray case. Within that case is the standard Blu-ray copy of the film. The disc featuring a piece of artwork that’s relative to the film and different from that of the case art. There is no DVD copy of the film included. A digital copy redemption pamphlet has been included for streaming options as well as a slipcover that features the same piece of artwork that’s featured on the case art. I did knock some credit off for the fact that the Snapchat advertisement on the slipcover is not a sticker and is actually printed on the case. The only case that includes this as a peelable sticker is the exclusive Best Buy Steelbook. As a special note to whoever is responsible for this particular atrocity, you should be fired. You do not deserve to be employed by anyone within the industry for this gross mistake. As my wife and I watched Jumanji: Welcome To The Jungle we found ourselves really enjoying this movie. Going into it with a lot of hesitation and fear that Hollywood would ultimately screw this up, they really did not disappoint with this movie. The chemistry between the cast was brilliant, and overall I found myself laughing more and more as the movie went on. 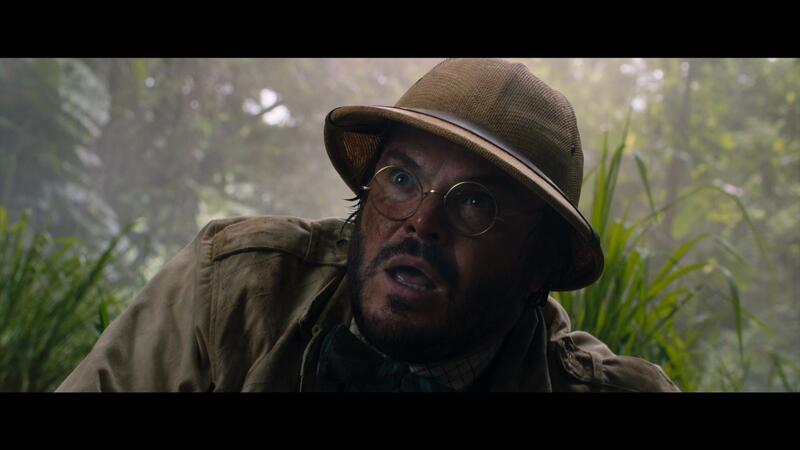 I mean, Jack Black’s character was absolutely hysterical. The story that we’re given with this movie is a nice continuation from the 1995 film. The presentation was decent enough that it offered a clean experience for viewers; however, it could have been better in terms of audio. 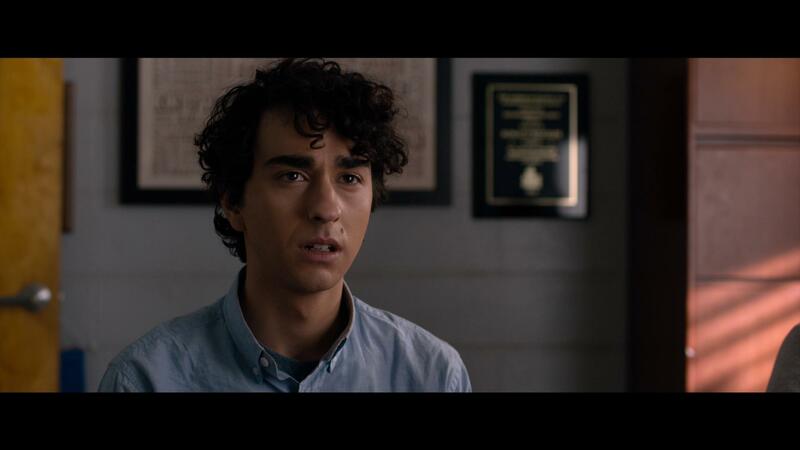 The special features offer a fun, extended look into the film and overall, offers a nice light experience should you decide to check these out. If you’re considering grabbing this film for your collection, I would absolutely recommend it. 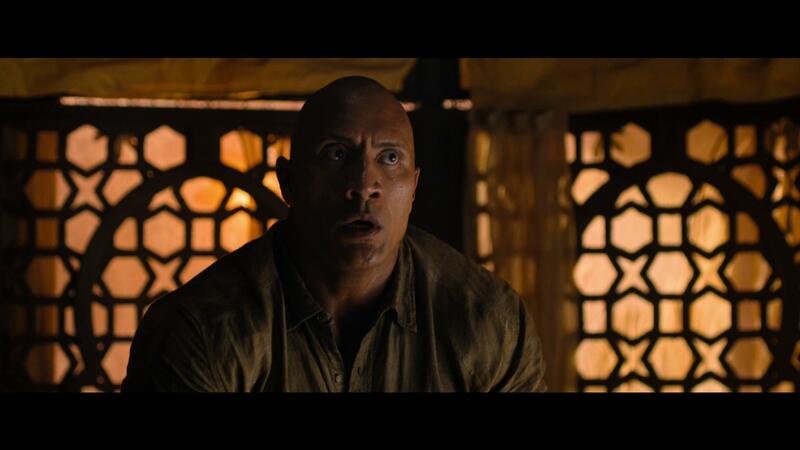 Jumanji: Welcome To The Jungle is available on 4K UHD, Blu-ray and DVD! Andrew shared his thoughts on the 4K UHD release of Jumanji: Welcome To The Jungle.